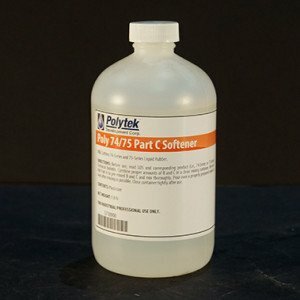 Poly 74/75 Part C Softener is an additive that can be added to the liquid 74 Series, 75 Series and 77 Seriespolyurethane rubbers to reduce their mixed viscosity and to soften the cured rubber. When Part C is used, cure time may be longer and there could be some loss of strength in the cured rubber as well as an increased tendency to shrink after repeated casting. To soften Poly 74-30 (A~30) to an A~15, mix 1A:1B:1C, by weight. 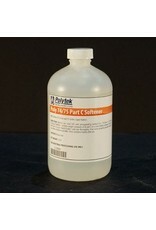 The amount of Part C to soften other products should be determined through experimentation.